There are two reports on the U.S. economy worth mentioning this morning. 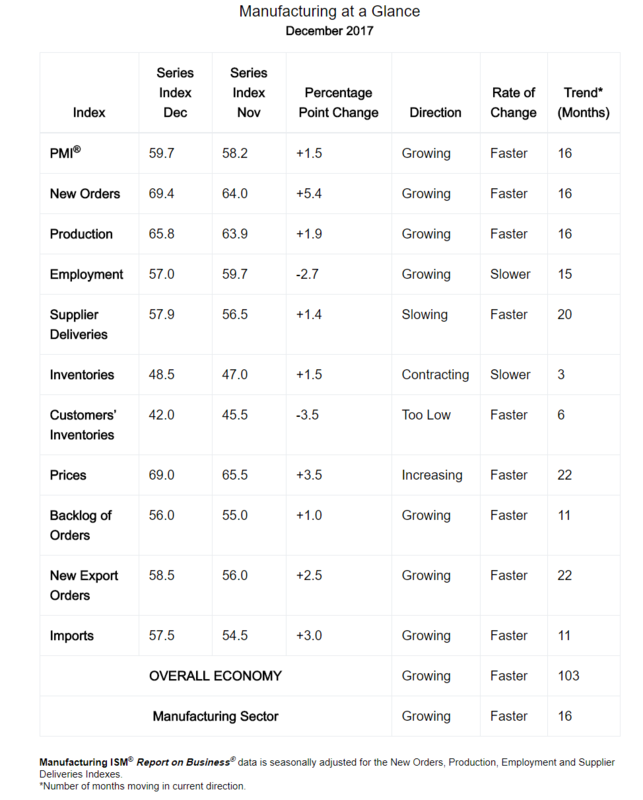 First, the manufacturing purchasing managers' index (PMI) from IHS Markit ended December at 55.1. That is up from 53.9 in November, slightly better than economists expected, and the highest headline reading since March 2015. 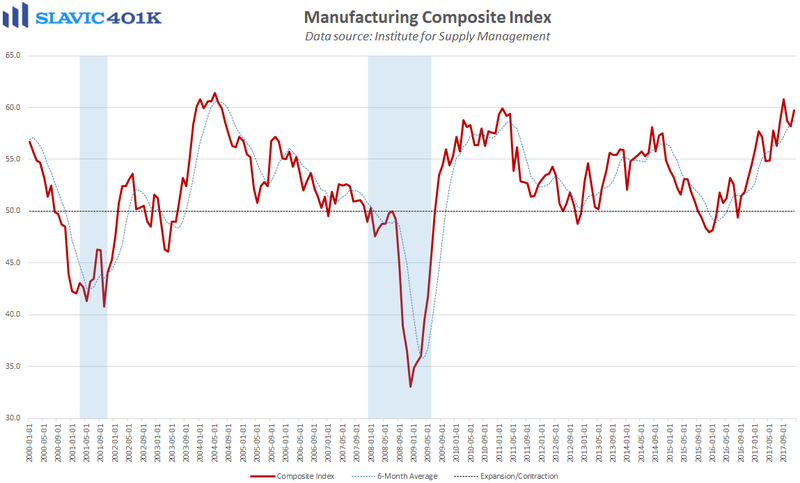 Most of the strength last month was due to a sharp increase in factory output, which surveyed managers attributed to more favorable demand conditions and increased new order volumes. Further, the uptick in new work in December put more strain on capacity and therefore contributed to the fastest rise in job creation since September 2014. Input cost inflation, though, also rose last month, but the increase in material prices could be just a temporary headwind related to supplier delays, according to the report. 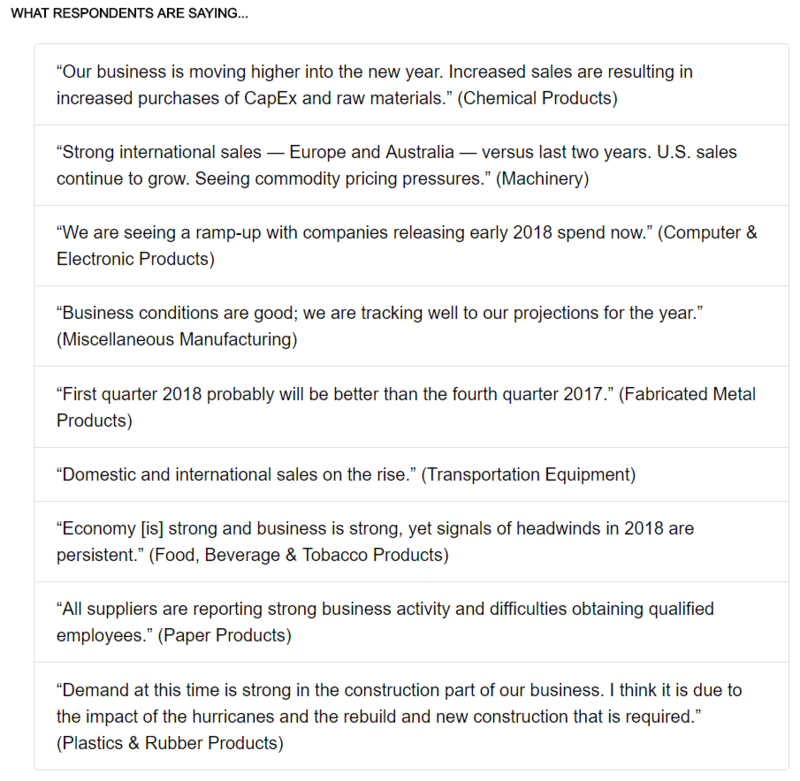 Chris Williamson, Markit’s chief business economist, added that “with business optimism about the year ahead running at its highest for two years in the closing months of 2017, companies are clearly expecting to be busier in 2018.” Similarly, the Institute for Supply Management's (ISM's) manufacturing index ended December at 59.7. That is up from 58.2 in November and much better than anticipated. Measures of new orders, production, and foreign trade all improved last month, and comments from surveyed managers were generally positive.